An injured man looking for medical attention shot a door at Reston Hospital Center and then fired another bullet inside the hospital Wednesday morning, Fairfax County police said. Police say 52-year-old William Brock went to the hospital with an apparent self-inflicted gunshot wound shortly after 1:30 a.m. When he arrived at the Pavilion II entrance of the hospital, he discovered it was locked and fired a shot at the door, breaking the glass, Fairfax County Police said. When he entered the hospital, staff saw he was in need of medical attention and tried to help him. "When they went to render aid, he again displayed the handgun and allegedly fired another round, discharged another round inside the hospital," said a police spokesman. "Nobody was hit. Nobody was injured." Staff at the hospital convinced him to put the gun down, police said. It is being held as evidence. Brock, a resident of Loudoun County, was stabilized and transported to another emergency room. He remains hospitalized under guard without bond pending his medical release. He is charged with felony destruction of property and shooting into an occupied building. 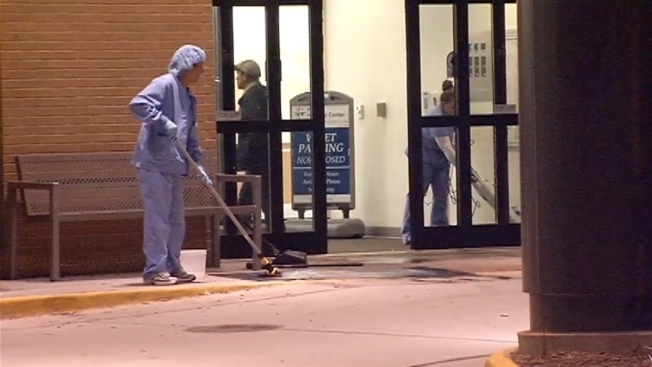 Reston Hospital Center resumed normal operating status quickly after the incident, police said.